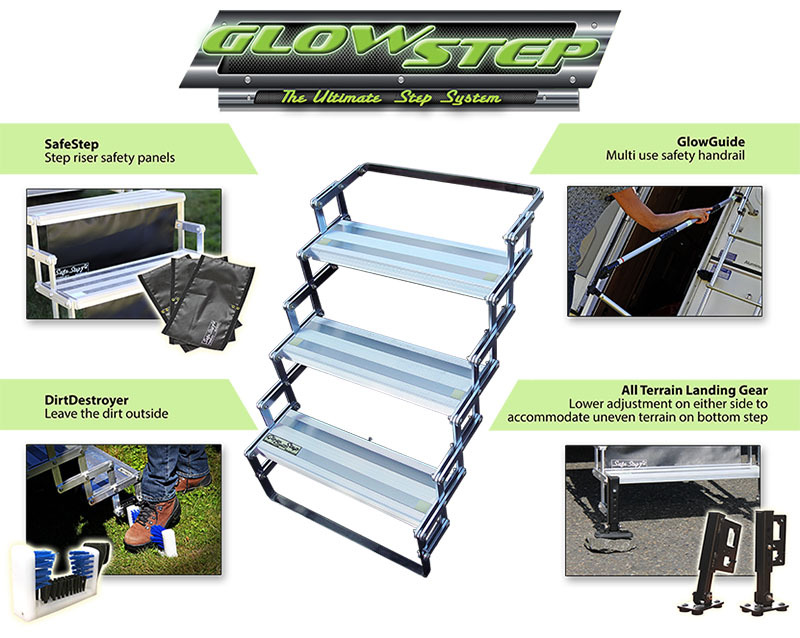 Achieve a safe and stable entry to your slide on truck camper or RV with the Original GlowStep system. These self-illuminating GlowSteps glow in the dark for up to 10 hours with just a few minutes of light exposure. No need to depend on battery power to light your entry steps. GlowSteps are available ranging in size from three to six steps with the option to add or remove steps using the Add-a-step option. Composed of 100 percent aircraft grade aluminum and stainless steel, the rust-free steps have a unique SureGrip™ step tread to create an anti-slip surface. 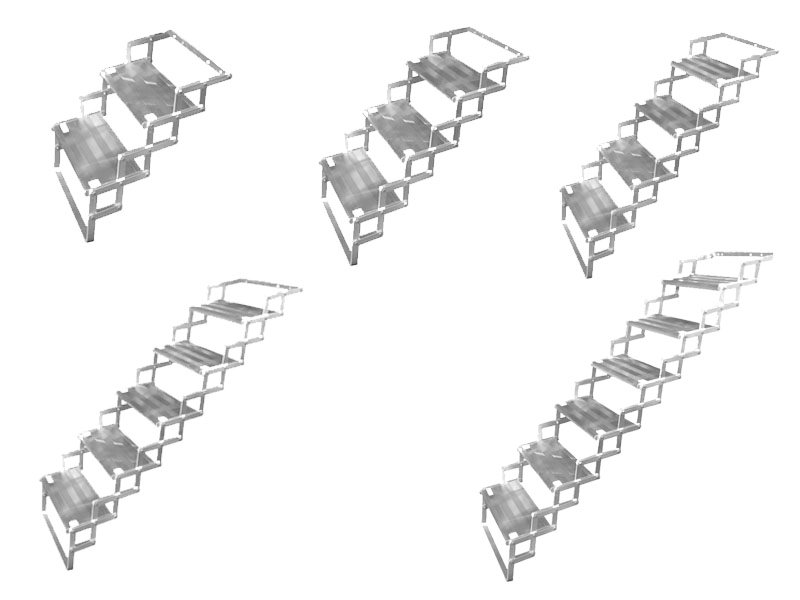 Engineered with a special hinge design, these steps deploy and retract with ease, yet are built to last. The GlowSteps are extraordinarily sturdy by connecting the RV all the way to ground level. Just like a well-constructed permanent home feature, the level of stability is simply unmatched. Design your GlowStep system to fit your needs. Accessories include the GlowGuide Handrail, SafeStep pet safety barriers and Dirt Destroyer shoe cleaning attachment. The GlowStep stores easily into position and is lockable to prevent theft. This lockable step system is also portable and has a Legendary Lifetime Warranty and is proudly made in the USA. 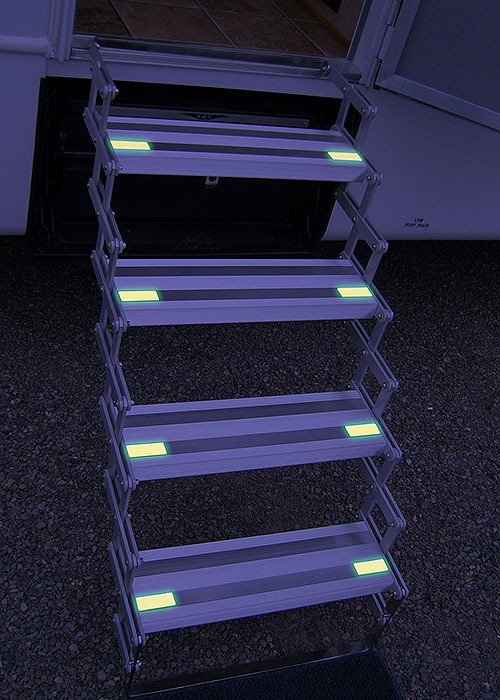 Known also as glow in the dark steps, scissor steps, folding steps or stairs and fold out steps or stairs, these steps are designed for most Rv's including slide on truck campers, (aka slide in truck campers, ute campers and tray campers), caravans and camper trailers, motor homes and 5th wheelers.